Computer Vision - If hours in front of a screen for school or work has triggered red eye, computer vision training can help. In addition to following the 20-20-20 rule (every 20 minutes, look at an object 20 feet away for 20 seconds) and adjusting your workspace for optimal vision, we can prescribe drops to help tear production. 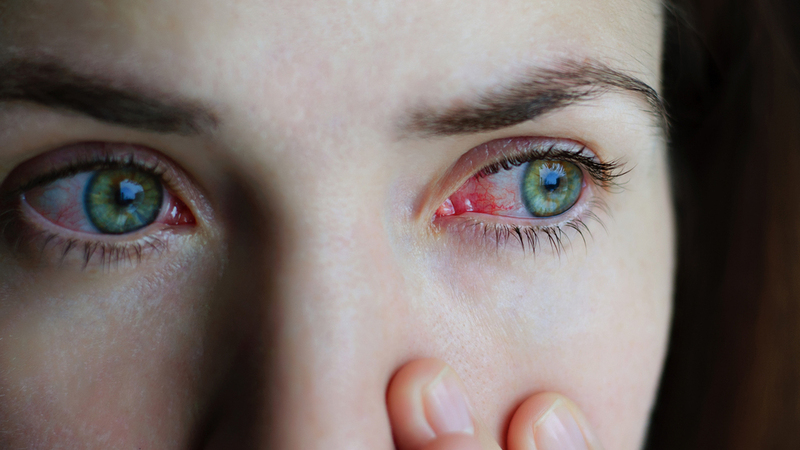 Conjunctivitis - An eye exam for conjunctivitis (pink eye) is important to distinguish between viral, which may be able to be treated at home with a cold, wet washcloth; and bacterial, which requires antibiotic eye drops or ointment. Contact Lenses - Improper contact lens care causes red eye. If you are following all directions, including regularly cleaning lenses and removing them at night, and still experience red eye, we can fit you for a different type of lens, such as daily disposables and lenses with moisture-rich materials like hydrogel. Dry Eyes - Chronic dry eyes can leave your eyes red and irritated. Diagnosis starts with identifying and removing triggers, including allergens and bad eye habits. Treatment includes artificial tear drops, medicated drops and the insertion of tiny punctual plugs to retain your natural tears. Injury: Whether you have scratched your eye with a fingernail or sustained an impact injury, a red-eye from injury requires immediate care at our optometrist in Wichita. At your exam, we will screen for infection, check for punctures and broken blood vessels and administer the proper treatment to prevent vision loss and promote healing. Glaucoma: If you suddenly develop painful, bright-red eyes accompanied by halos around lights, vision loss or nausea, urgent care is required to lower intraocular pressure and prevent permanent vision loss from acute angle-closure glaucoma. Red eye help is a phone call away. Call your Wichita eye doctor to schedule your next appointment (316) 942-7496.